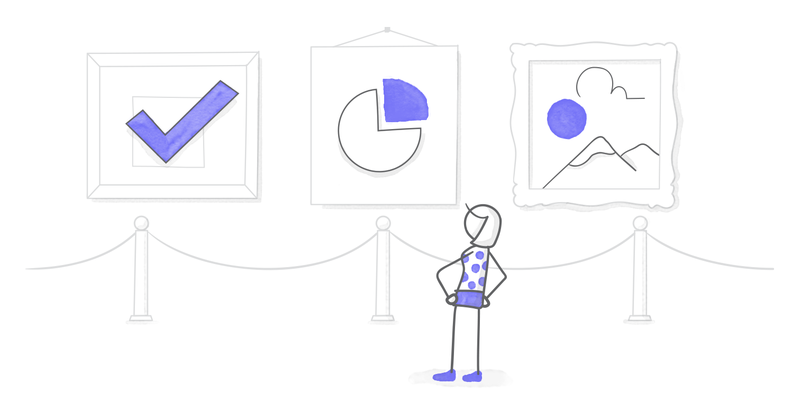 With so much selection out there, choosing graphics for e-learning is a real art. How do you know which to choose? And how do you make sure it looks good, has learning value, and works with the rest of the course design? To help make it a little more concrete, I’ve compiled this guide to help you choose awesome graphics in your next course. Follow these steps and you should end up with some great imagery! One of the first things to consider is whether to use photos or illustrations, or a mix of both, in your course design. There are pros and cons to both styles: photos tend to be considered more professional, but clip art can be easier to find and manipulate, and is typically more affordable. Let your content guide you to a decision; certain subject matter will naturally work better with one type or another. Whether you choose photos or illustrations, it’s a good best practice to stick with one style throughout your course. However, if you feel you have a good eye for design and a clear sense of what works visually, you can mix and match the types. When you’re deciding whether to use photos or illustrations, you’ll want to think about who your audience is. Your audience could vary widely: maybe you’re building a course for teenage high school students, or maybe it’s for business executives. The bottom line is, you’ll consider different types of graphics if you’re designing a fun course for a youthful audience than if you’re developing a professional course for businesspeople, so don’t forget to consider the audience. It’s nice to have the freedom and flexibility of a big budget, which opens up more options, but, realistically, we often have budget constraints that affect our selection. If you know early on what your budget is for graphics, you’ll save yourself the time and effort of poring over images that are out of reach. Regardless of your budget, DIY photography is an option, too. If there is a situation or specific subject matter you need photos of, and your budget is limited, you might want to take your own photos. Or, if you have a large budget, you might be in a position to consider custom illustrations or high-quality custom photography. If you’re on a tight budget and don’t have your own photos, you’ll need to find some free, high-quality images. Luckily for all you Articulate 360 subscribers, with Content Library you have access to over 2 million stock images and videos—and they’re all free with an Articulate 360 subscription. When using images that aren’t your own, it’s important to consider usage rights. For example, you may find some great images by doing a simple web search—but you need to have the appropriate rights to use them in order to avoid potential fines and legal consequences. If you’re using images from Content Library or the downloads sections of E-Learning Heroes, you don’t have to worry about image rights—you’re free to use any of those images in e-learning courses that you create with Articulate software. As long as you don’t redistribute those images on a stand-alone basis, you’re good to go. These types of images are used more for decorative value than for learning value. A background image, the title slide, a welcome screen: these are all areas where you might include images simply for aesthetic and visual appeal. Some might argue that a course that looks good is actually more engaging and interesting for a learner. This use works best in moderation, so be careful you don’t fall back on it to justify too many of your images. While it’s fine to have some decorative images, the real purpose behind your graphics selection should be to boost learner understanding of the knowledge and skills you’re teaching. Whether it’s a flowchart to illustrate a process or a detailed image to highlight important parts of an object, we all know that a picture can be worth a thousand words. When selecting your photos, go for quality over quantity. Low-quality images are distracting and sloppy, and they take away from the overall polished and professional feel of a course. Make sure the images you select are crisp, high-quality, and large enough for the way you want to use them. Aside from image quality, something else that can affect the overall look of your course is consistency with your graphics use. This means that if you’re using clip art in your course, it’s best to stick with one style of clip art throughout. If you’re using images, use images that are consistent in quality and tone. If your images look very different, you can unify them by applying a simple filter such as a color overlay or a black-and-white effect. The next time you want to choose graphics for an e-learning project, you’ll save effort and end up with a great result if you follow the tips outlined above. Do you have any tips of your own for choosing graphics for e-learning? If so, leave a comment below. We love to hear your feedback! I was just choosing an image site this afternoon -- this came around at the perfect time. Thanks Nicole! Happy to help, Andrew! Hope you found the perfect graphics for your course. Does anyone know if the wonderful graphics in the "Downloads" section of e-Learning Heroes are ok for commercial use? I couldn't find a page on the community site with details about usage rights for the downloads here. Thanks folks!